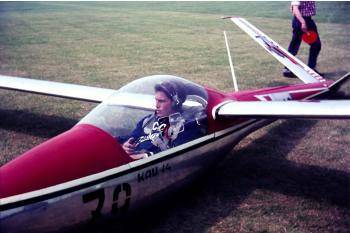 he KAI -14 was a single seat standard class glider designed in 1962 by the Special Design Bureau KAI, with the direct participation of M. Simonov, V.S.Chupakova, F.Grojsmana and others . As well as soaring, the KAI-14 was also capable of aerobatics.It was built in two distinct versions. 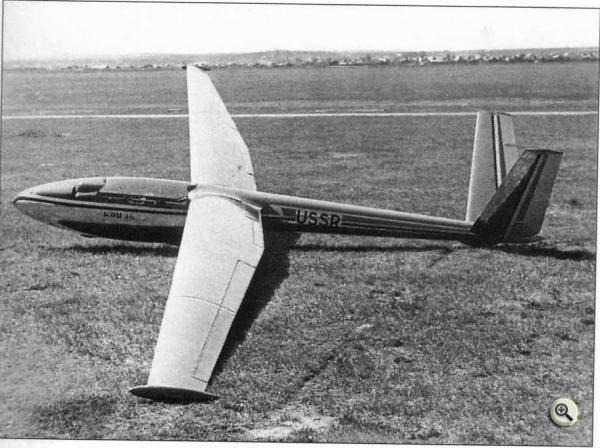 The cantilever design had a shoulder mounted laminar-flow profile (NACA-63 (420) – 517) high-aspect-ratio wing with a V-shaped tail assembly. The main spar root fittings were substantial aluminum alloy forgings. The dies for these two different forgings would be very expensive and they would not have been produced unless a considerable production volume had been expected. Construction of the glider was all-metal. The wing was of monospar construction with a stressed skin. The leading edges of the wings are swept forward by 2° and have a dhedral anglel of 4°. The fuselage was a monocoque type, assembled from formers and again with a stressed skin. The midship section of fuselage was able to be reduced due to the reclining position of the pilot in the cockpit. The entire surfacse of the wing, fuselage and tail assembly was highly polished for minimum air resistance. Landing the glider was on a non-retractable main wheel and a tail skid. The mechanism for transferring the controls to the V-tail assembly was fitted in the aft fuselage section. 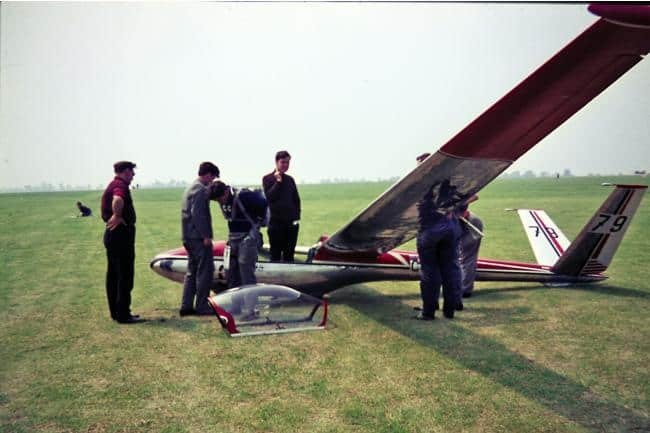 The second version of the KAI-14 was intended for volume production and had the same construction, except that the pilot now sat upright in the cockpit, which was covered with a new raised canopy. 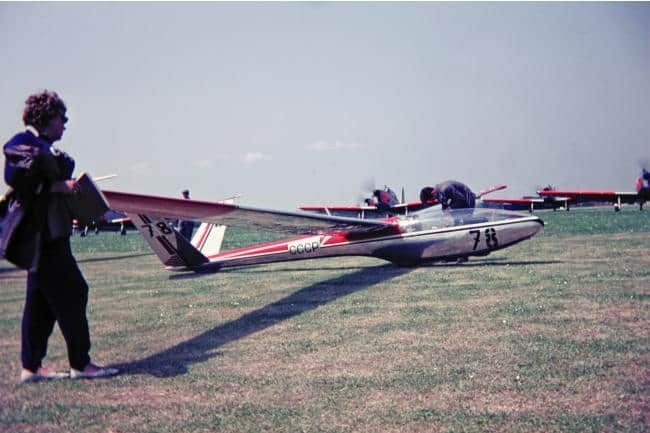 The two versions of the KAI-14 appeared at the World Championships held during 1965 at South Cerney, England where the accompanying colour photos were taken . There, the Russians came in for a lot of attention, especially these KAI- 14‘s entered in the Standard Class. 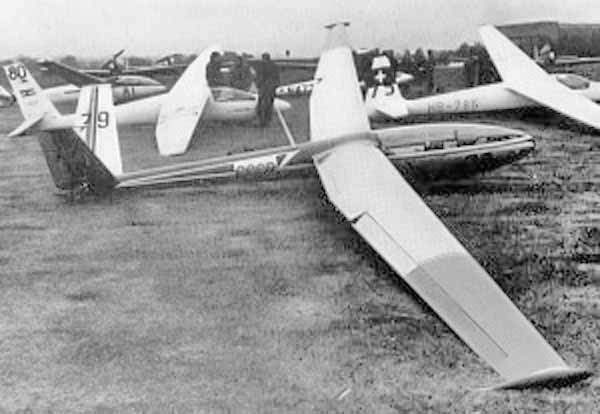 The gliders were given the nickname “The Tea Spoons” because of the very slender fuselage and the spoon-like shape of the cockpit when the canopy is removed. Both of the Russian Standard Class KAI-14’s were damaged early in the Championships, Mr. Kamishov, the designer of these ships, who came along with the team, attributed the cause of both incidents to “pilot error”. Suslov made a landing in a grain crop with a cross wind. Mr. Kamishov stated that the pilot was slipping and touched the ground simultaneously with the wheel, the wing tip and the tail skid. The result was a ground loop. Jarushevichus landed on uneven pasture, ballooned and stalled in. 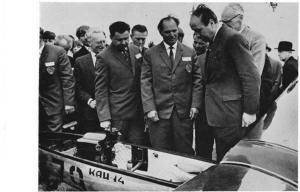 The KAI-14 seems to have had a rather high landing speed, stated by the designer to be approximately 45 mph. Vision iwas none too good owning to the rather extreme recumbent posture of the pilot. Suslov’s ship needed a major repair job. This was carried out by the R. A.F. and Suslov was soon flying again. The damage to the other ship was reported to be repairable but not in the time available before the end of the Championships. 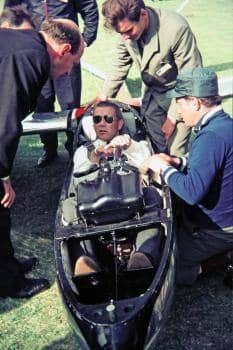 Suslov subsequently flew with the “training canopy”, which allows a less recumbent posture with the resultant increased drag. The third copy of the KAI-14, was used for spinning tests and carried out 21 flights. The maximum lift-drag ratio, obtained in the process of flight tests, was 39:1 and minimum sink speed 058 m/s. This data, at that time, exceeded the indices of the best domestic and foreign gliders in the standard class.